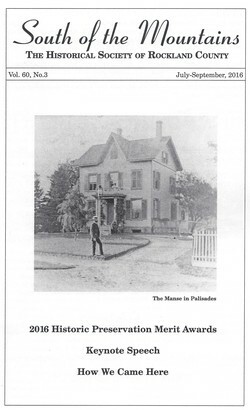 Five awards in three different categories, as well as four special commendations, were given this year at the Rockland County Executive's Historic Preservation Merit Awards Program and Country Supper on May 15. The keynote speech at the Awards Supper was given by Liz McEnaney, an adjunct professor at the Graduate School of Architecture, Planning and Preservation at Columbia University and the executive director of the SS Columbia Project. Richard Luzzi was a small-business owner in California for thirty-five years. He thanks the Fillipi Order of nuns at Our Lady of Sorrow Catholic School for keeping him on the straight and narrow of a fairly jagged road. COVER PICTURE. The Manse in Palisades, circa 1880. From the collection of the Palisades Free Library.